On my needles this week, nothing! I finished my Rainbow Shawl through the week, photos for yarn alongers following my progress here. Since then I’ve also completed two more projects Little Bee Flowerpot and Butterfly Flowerpot. Though I may be without knitting I am obviously not without a project and so on my hook this week is the stripy base for my latest wreath and some autumn leaves. There are going to be lots and lots of leaves on this finished item so expect more over the coming weeks. For now I’ve only just started! Remember my Little Bee Flowerpot from a few days ago? As I mentioned I bought the flowerpots in bulk so had more available to play with, and this is my latest idea. Butterfly pattern from Crochet Zone, roses still from Attic24 (I love her patterns!) and yarn is Stylecraft Special DK. I suspect there will be more little flowerpots here very soon! And a quick picture of the two together! I finished my shawl! 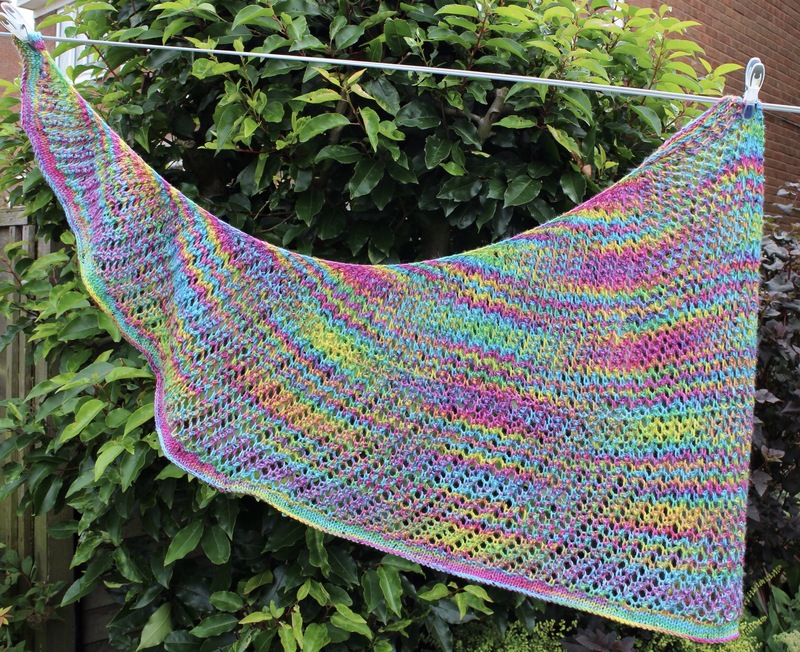 Just 3 days ago I published a Yarn Along post in which I described this shawl as never ending and yet it turns out a rainy bank holiday weekend was all that was needed to get it finished. But before I rush straight into the finished article here’s a bit of background. 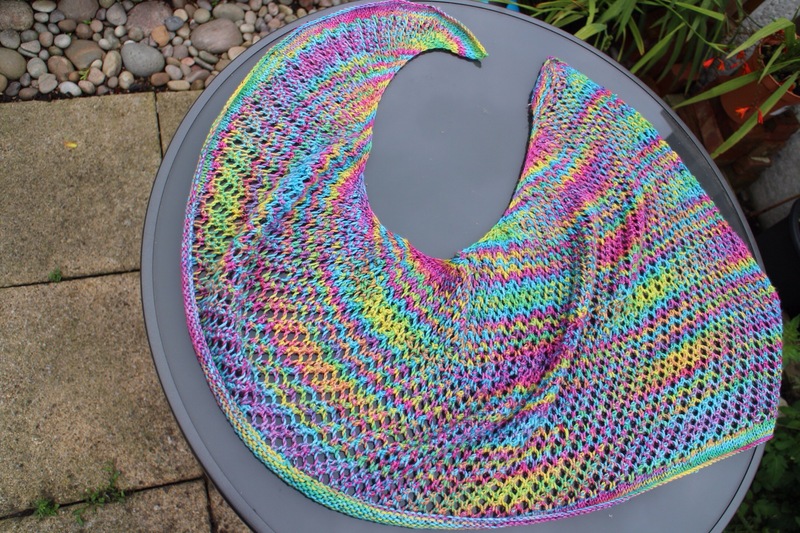 Last month I was browsing a Facebook group of lovely yarny people and saw a photograph of a Hitchhiker shawl made from a beautiful yarn that looked like little flashes of rainbow on a darker base. Straightaway I had to ask where it was from. It was hand dyed by the wonderful Arwen Makes and was called Jewel Rainbow. 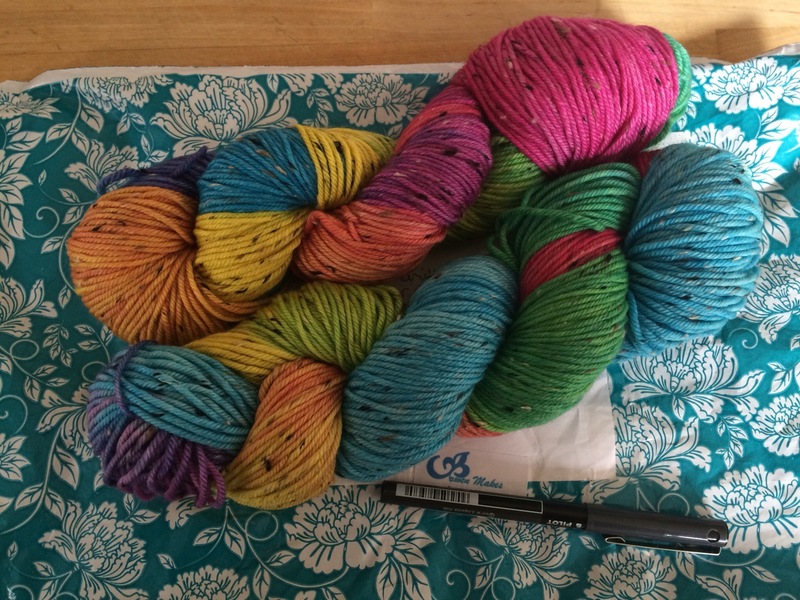 I got in touch but she didn’t have any more of this colour way on a sock weight yarn for me to recreate the shawl I had fallen for. She did however have two skeins of the same colour on a DK weight Donegal Nep so I snapped them up! Then I started searching Ravelry for something to make that would show it off. I chose the Breathe shawl by Siew Clark which you can get for free here. It seemed like a fairly straightforward pattern and I thought the eyelets would help the heavier weight yarn to drape nicely. 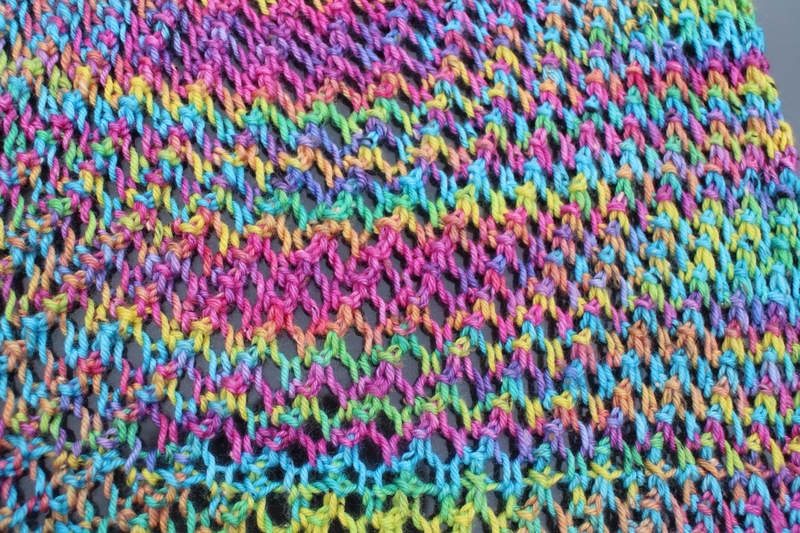 I also liked that it was a chilled out pattern that can be worked in any yarn, with any needles to make any size. I cast mine on to 4.5mm needles and planned to go until I ran out of yarn. And despite a couple of wobbles where I was sorely tempted to bind off earlier I did indeed continue until there was just 20g left (the buffer being there because the last 4 rows are a different pattern and I couldn’t face a game of yarn chicken). So would you like to see? How about a little close up tease? Sorry what was that? You want to see the finished shawl? Oh go on then! Now just to wait for a cool, crisp day to snuggle up under those beautiful rainbows. I am really very pleased with my latest creation. It is a gift for a friend who sent me a message casually asking if I sell the things I make! I told her no, but I do gift them and left it at that. Then I got to thinking what to send her. She is an amateur beekeeper and outdoorsy person and as I was walking past my Summer wreath the little bee caught my eye and this design popped into my mind fully formed. After a fruitless search around local shops for teeny tiny terracotta pots I ended up buying online (which means I had to by in bulk and so will almost certainly end up making more of these little pots of flowers). The bee pattern is from Moho blog, the rose, a real favourite of mine at the moment from Attic24 and the design is mine. And another photo because I can’t help admiring this from all angles! And one last one to show the scale! The polystyrene ball has a diameter of just 6cm. I hope she likes it. I definitely do! On my needles this week the never-ending shawl. Still. On my kindle Dissolution by C.J. Sansom. Yarn Along has helped me to make some progress on the shawl despite me being thoroughly fed up with it. Last week I set out my intention to start on the second ball of yarn before today and I have achieved that goal! The pattern is one of those that says “continue pattern until required size is reached” and I find myself knitting up those super long rows wondering if maybe it is big enough yet. Or daydreaming about all of the lovely things I could make with the rest of this soft snuggly yarn if I just stopped now. But it is that self same snugglyness that is keeping me going. I know I will love this shawl more if it is big enough to completely envelop my shoulders and and so I knit on. I have added a row to the habit tracker in my BuJo with the target of knitting 4 rows a day and I am trying very hard to knit those 4 rows before picking up anything else. I have bought the yarn for my autumn wreath and it is sitting patiently waiting for me while I try out something new which is almost finished and I will hopefully be able to share here in the next couple of days. So thats the craft situation. On to the books! I finished American Gods at 2am which I think is a pretty good recommendation for any book! I really loved how different it was to anything else I have read recently and how the plot twists and turns meant I never managed to work out quite where it was going which kept me wanting to turn the pages rather than sleep. I started Dissolution this morning with my breakfast so don’t have much of an opinion just yet. This book has been on my to read list for around 18 months and got bumped closer to the top following a conversation with a friend who had just finished it and moved straight on to the next in the series, which is a great measure of how much she enjoyed it. The deciding factor in choosing it now was the same friend pointing out it was reduced to 99p on kindle. Because when there are hundreds of books on your to read list you might as well choose them based on what’s cheap! As you know my blog is pretty new and I started it not quite sure what I wanted it to be. I knew I wanted to share the beautiful things I made and saw and maybe some of my thoughts on stuff in general and I think that’s what it is panning out to be. I did know that I wanted to join up with other bloggers in some sort of craft related link up and so I have been keeping my eyes peeled as I browse around some of the fantastic creativity there is on t’internet. I was utterly thrilled to come across Ginny at Small Things because her Yarn Along is right up my street. Each Wednesday she shares what she is reading and what she is knitting, the perfect combination! So I shall be accepting her kind invitation to join her and also plan to share my Yarn Along each week. This has however posed an aesthetic issue for me! Being a busy mum to 3 young children I find opportunities to sit and read are few and far between and so my reading is almost all snatched in short bursts often alongside other jobs. The exception to this is should I have any energy left by the end of the day then I like to read in bed, next to my sleeping husband who has to get up much earlier than I do. I discovered very early on in my parenting journey that it is really difficult to prop open a book and turn the pages with just one hand when the other is occupied tending to the needs of a small person. I turned to Kindle and have never looked back. Now I read while cooking, changing the page with the press of an elbow if my hands are mucky; I read while emptying the washing machine and folding laundry; I read while knitting, again with the elbow page turning; I read in the woods while my children search for the elusive perfect stick, here using the nose press to turn the page if my hands are encased in gloves; and I read in bed with the light turned off! But ebooks are nowhere near as photogenic as their printed siblings. This week I have decided to put my kindle in the photograph and the front cover of my book pulled up on the kindle app on my tablet. I’m not in love with the look to be honest. So I shall give it more thought over the next 7 days and see what I come up with. Here is my first Yarn Along photograph! On my Kindle American Gods by Neil Gaiman. I started this yesterday and am loving it so far, I’ve been completely swept up in the story. I love rainbows! And whipping up quick little projects in between the bigger things that can sometimes feel like a slog. Here are my latest quick rainbow makes. But they are both gifts so shhh, don’t tell just yet! This gorgeous little crochet heart hanger was made from an Attic24 pattern, the heart pattern is by BeaG and the yarn is a teeny bit of the stunning Jewel Rainbow I am sloooooooowly working up into a shawl hand dyed by Arwen Makes. This is a new home gift for a friend who will be moving soon. This adorable baby hat is fresh off the needles today. I really did not enjoy sewing in all the pesky ends the rainbow created but look how cute it is! This hat is destined for a baby that has yet to join us earthside and so will have to go away for a few weeks until she is ready to meet us. The pattern is by Little Red Window and yarn is Stylecraft Special DK in grey, fondant, spice, sunshine, green, turquoise, royal and violet. I suppose that now these are finished and blogged about I should probably go and crack on with one of my big works in progress that keep stalling as I get distracted by quick wins. Or maybe I’ll order some yarn for my autumn wreath….